Antique Silver Cast Iron Starfish Toilet Paper Holder 10"
Rustic Dark Blue Whitewashed Cast Iron Decorative Fish Bone Toilet Paper Holder 11"
Rustic Dark Blue Whitewashed Cast Iron Pelican on Post Toilet Paper Holder 11"
Cast Iron Decorative Fish Bone Bath Towel Holder 28"
Whitewashed Cast Iron Number 7 Wall Hook 6"
Rustic Gold Cast Iron Decorative Bird Hook 6"
Rustic Copper Cast Iron Seahorse Hook 5"
Antique Silver Cast Iron Sea Turtle Toilet Paper Holder 10"
Seaworn Blue Cast Iron Decorative Dolphins Toilet Paper Holder 10"
Seaworn Blue Cast Iron Lobster Towel Holder 9"
Antique Silver Cast Iron Mermaid Bath Towel Holder 26"
Antique Copper Starfish Towel Holder 9"
Rustic Silver Cast Iron Butterfly Fish Towel Holder 7"
This Antique Silver Cast Iron Seashell Napkin Ring 2" -set of 2, is the perfect addition for those with a nautical theme kitchen. Strong, sturdy, and durable buy a set of these napkin rings to accomodate all of your guests. 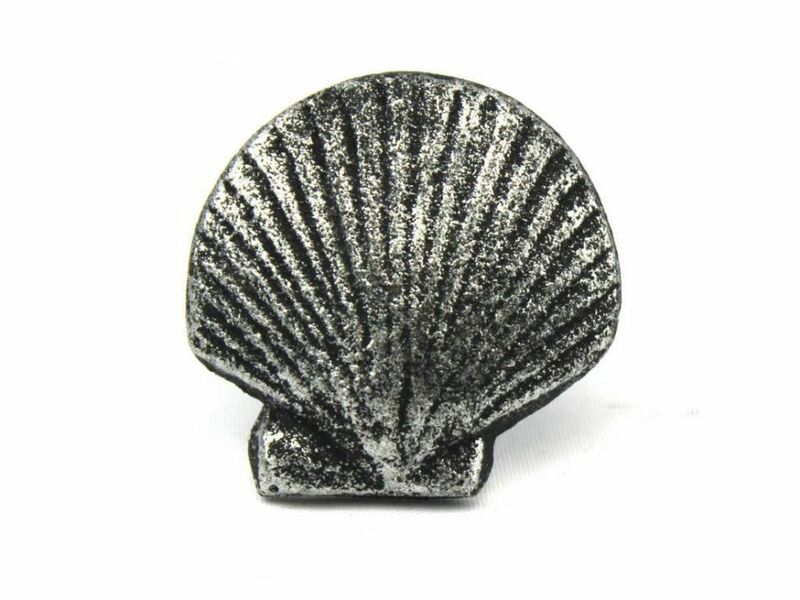 The brass finish on this seashell will infuse your dining area with a rustic nautical appearance.